Is IveyPoker.com a Poker Site or a Training Site? I still haven’t quite figured out what is going on over at IveyPoker.com, or what that site is planning on growing into, but I will say that the usually private Phil Ivey has been front and center in promoting the site that bears his name, and IveyPoker.com has been pretty active with signing poker players and marketing them. Now we just have to wait and see what the site actually is! 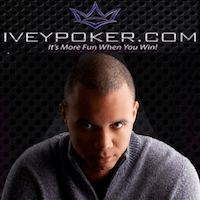 Ivey, normally known as a player who shuns the limelight, and not known for marketing campaigns has been active on social media (or at least someone posting as Phil Ivey has been active) but poker players are still curious as to his affiliation with the site that bears his name. Some people have been wondering why a man with Ivey’s resources would be launching such an endeavor, perhaps implying that he is merely leasing his name to someone and not technically an owner of the site, which is just conjecture at this point. Whatever the case may be, the site seems to be pushing forward, and has been doing a good job getting their brand out to the public. The most recent addition to IveyPoker.com was the signing of Cole “CTS” South to the site’s roster, which already includes Patrik Antonius, Jennifer Harman, 2012 WSOP Main Event winner Greg Merson, and of course Phil Ivey. In addition to the signing of South, IveyPoker also added a video interview with Greg Merson regarding his WSOP win to the site’s landing page. South is an online poker legend, and one of the original Cardrunners coaches. A well known high-stakes regular, Cole South is also known for co-authoring the first high-priced poker eBook, when he and Tri Nguyen wrote the 84-page poker strategy guide that changed the face of poker, Let There be Range. The groundbreaking book cost a cool $1,800 when it was released, but many players credit the text for changing their game and allowing them to move-up in limits. South is the first “true” poker coach on the IveyPoker.com roster, as Jennifer Harman, Phil Ivey, and Patrik Antonius are better known for their sick accomplishments at the felt than for giving away their secrets, and Greg Merson’s WSOP performance has just recently catapulted him into the upper echelon of poker players. Thus far IveyPoker.com seems to be a free online poker training site (the site is still in a developmental stage at this point) that will also host some type of free-play poker room, potentially setting the stage for a real-money version should legislation in the United States change in the future. Right now you can join the site’s mailing list through your social media accounts, which has me thinking it will be a Zynga-type poker game when fully launched. We’ll be sure to update you as more progress is made at IveyPoker.com, and have a better grip on what the site will be when the site officially launches.